Study for a qualification in ITIL Operational Support & Analysis (OSA) by taking an online training course from 4PA e-Learning! The course is designed to help you to prepare to take and pass the exam leading to the ITIL Intermediate Certificate in Operational Support and Analysis. Success in the exam will also earn you 4 credits towards the 22 credits needed to gain the ITIL Expert qualification. Why Study ITIL OSA with 4PA? This eLearning course contains all the learning materials you need in order to prepare for the ITIL OSA exam. Our course has been accredited by PeopleCert, who are licensed by AXELOS as an Examination Institute for the ITIL® Operational Support & Analysis Certificate in IT Service Management. In addition to the resources provided, the examination guidance recommends that candidates should complete at least 30 hours and30 minutes of personal study. This module provides an introduction to the core concepts and terminology of the service life-cycle, and the role that OSA activities play within the life-cycle. This module covers how the process of event management contributes to OSA practices. A complete overview of the objectives, scope and importance of event management as a process to generate business value are explored. Event management policies, principles, concepts, design, activities, methods and techniques are explained in relationship to OSA practices as well as to information management. This module covers how the process of incident management contributes to OSA practices. A complete overview of the objectives, scope and importance of incident management as a process to generate business value are explored. Incident management policies, principles, concepts, activities, methods and techniques are explained in relationship to OSA practices. This module covers the request fulfillment process and how it contributes to OSA. A complete overview of the objectives, scope and importance of request fulfillment as a process to generate business value are explored. Request fulfillment policies, principles, concepts, activities, methods, request models and techniques are explained in relationship to OSA practices as well as to information management. This module covers how the problem management process contributes to OSA practices. A complete overview of the objectives, scope and importance of problem management as a process to generate business value are explored. Problem management policies, principles, concepts, activities, methods, problem models and techniques are explained in relationship to OSA practices as well as to information management. This module covers how the access management process contributes to OSA practices. A complete overview of the objectives, scope and importance of access management as a process to generate business value are explored. Access management policies, principles, concepts, activities, methods, access models and techniques are explained in relationship to OSA practices as well as to information management. This module covers the service desk function and how it contributes to OSA. A complete overview of the objectives, scope and importance of the service desk as a function to generate business value are explored. Service desk policies, principles, concepts, activities, methods and techniques are explained in relationship to OSA. Also covered is the service desk role, organizational structures, staffing options and outsourcing strategies. This module deals with how the service operation functions of technical management, IT operations management, and applications management contribute to OSA practices. For each function, the roles are defined along with the objectives, scope, importance, policies, principles, concepts, activities, methods and techniques in relationship to OSA. This module covers technology implementation as part of implementing service management process capabilities. It also covers the special technology functions and features that are related to OSA practices. This module prepares you for the ITIL Operation Support and Analysis examination. Thinking of sitting the ITIL Operational Support & Analysis Exam? On this page, you will find everything you need to know! In order to achieve this ITIL Intermediate qualification, you must pass the ITIL® Operational Support & Analysis Certificate in IT Service Management exam. To pass the exam you must get 28 out of 40 questions correct, or 70% and if successful, delegates will gain 4 credits towards ITIL Expert level. The course materials provided in the Operational Support & Analysis eLearning course will provide you with all the information you need for this exam. 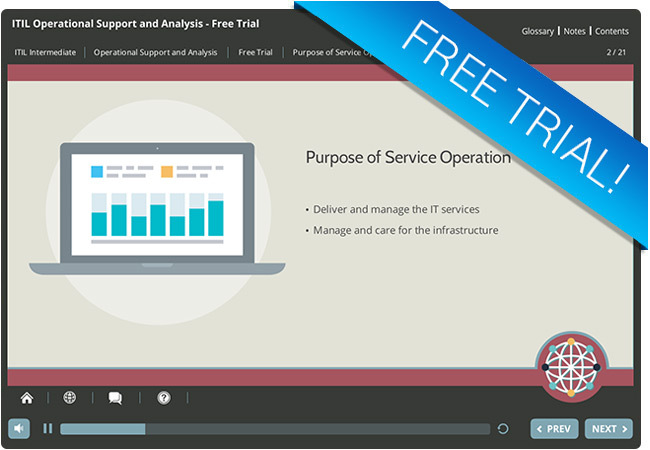 Why not try out a free trial module from our ITIL Operational Support & Analysis eLearning course! In this ITIL Intermediate trial module, you will gain an understanding of how to apply OSA practices in resolution and support of the service management life-cycle. Like the full ITIL Operational Support & Analysis (OSA) eLearning course, you can access this free trial module from any device whether you are at home, at work, or on the move!